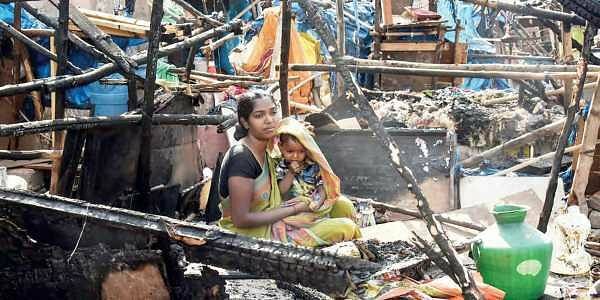 HYDERABAD: While a compensation of Rs 7,900 was handed over to the victims of a massive fire that charred close to 150 huts in the underbelly of IT corridor in Madhapur, the slum dwellers allege discrimination. The government officials divided the compensation amounts into Rs 3,800 and Rs 4,100 for tenants and owners of huts respectively. A large number of dwellers at Patrika Nagar are tenants and they complain that though they have lost everything, a part of the compensation is being given to the hut owners. Of the 150 huts, 60 belonged to families who have taken the huts on rent. Also, all the victims were handed over bank cheques and most of them do not even have a bank account. A Komala, a slum dweller received a cheque of only Rs 3,800. “The remaining amount is received by the owner of the hut. We are paying a monthly rent of Rs 1,000 to the owners who live in some other area in the city. Even though they have not lost anything, they have received a compensation Rs 4,100,” she added. Another resident, G Rajitha claimed that she did not receive any compensation yet. Rangareddy district collector M Raghunandan Rao, when contacted, told Express that more cheques are being issued in the coming days. “We will enquire into how certain cheques were issued to owners of huts. It is government land meant for GHMC park. Soon, we will rehabilitate the slum dwellers,” he said. As the slum dwellers lost their shelters, they were forced to spend a night under the sky. Some were taken by organisations, which came forward with supply of food and drinking water.